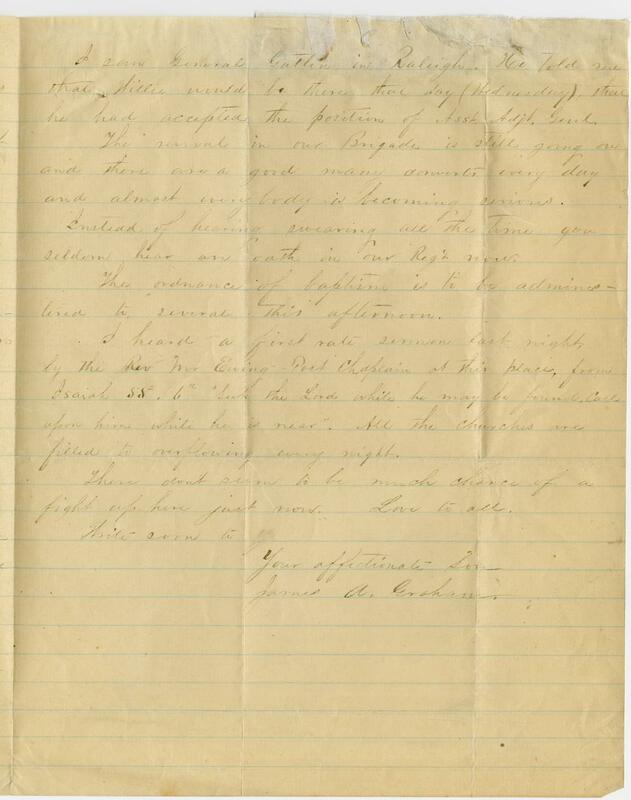 Item description: In this letter, 4 October 1863, James Augustus Graham, an officer in Company G (Orange Guards), 27th North Carolina Infantry Regiment, wrote home to his mother, updating her on his travel back to camp near Gordonsville, Va. He reported that his rail travel plans had been altered due to the number of Yankee prisoners passing through and that the contents of his carpet bag had been stolen at the train station at Raleigh. He also noted his recent clothing purchases and that a religious revival was going strong in his brigade. Item citation: from folder 2 in the James Augustus Graham Papers #283, Southern Historical Collection, Wilson Library, University of North Carolina at Chapel Hill. I wrote to you last Wednesday while on the train between Raleigh & Goldsboro, but as I don’t know whether you ever received it or not I will write again. When I reached Raleigh on Teusday morning, I had to lay over there as everything was crowded with Yankee Prisoners. As I expected to go off on the next train I left my baggage in a room at the Depot where I was told it would be perfectly safe as there was a guard about there and this room was only opened for a short while on the arrival of each train. 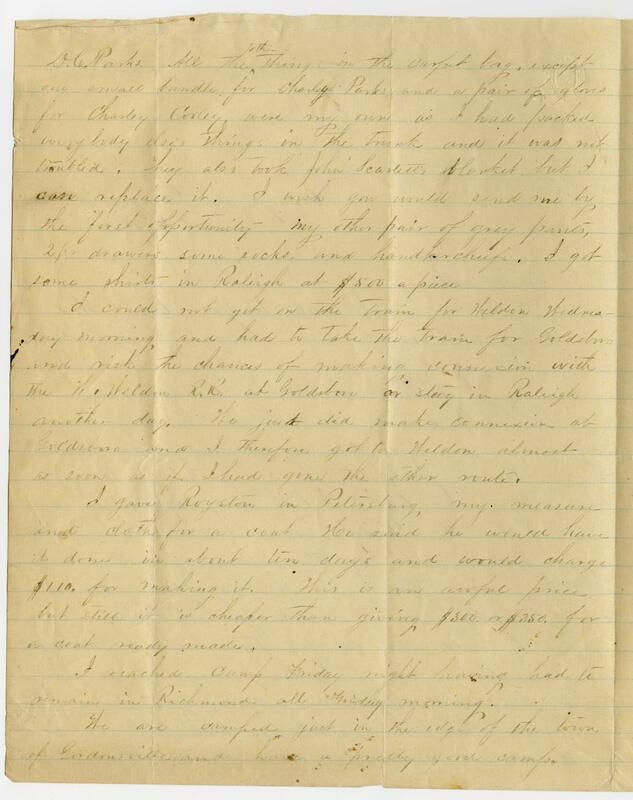 I could not get off that night on account of another crowd of Yankee prisoners and when i went to the depot next morning to leave I found that my carpet bag had been robbed of all its contents except a flannel shirt for D.C. Parks. All the other things in the carpet bag, except one small bundle for Charley Parks, and a pair of gloves for Charley Cooley, were my own as I had packed everybody else’s things in the trunk and it was not troubled. They also took John Scarlett’s blanket but I can replace it. I wish you would send me by the first opportunity my other pair of grey pants, 2 pr drawers some socks, and handkerchiefs. I got some shirts in Raleigh at $500 a piece. I could not get on the train for Weldon Wednesday morning and had to take the train for Goldsboro and risk the chances of making connexion with the W. Weldon R.R. at Goldsboro or stay in Raleigh another day. We just did make connexion at Goldsboro and I therefore got to Weldon almost as soon as if I had gone the other route. I gave Royston in Petersburg my measure and cloth for a coat. He said he would have it done in about ten days and would charge $110 for making it. This is an awful price. but still it is cheaper than giving $300 or $350 for a coat ready made. I reached camp Friday night having had to remain in Richmond all Friday morning. We are camped just in the edge of the town of Gordonsville and have a pretty good camp. I saw General Gatlin in Raleigh. He told me that Willie would be there that day (Wednesday). that he had accepted the position of Asst. Adjt. Genl. The revival in our Brigade is still going on and there are a good many converts every day and almost everybody is becoming serious. Instead of hearing swearing all the time you seldom hear an oath in our Reg’t now. The ordnance of baptism is to be administered to several this afternoon. I heard a first rate sermon last night, by the Rev Mr Ewing Post Chaplain at this place. from Issiah 55. 6 “Seek the Love while he may be found. Call upon him while he is near.” All the churches are filled to overflowing every night. 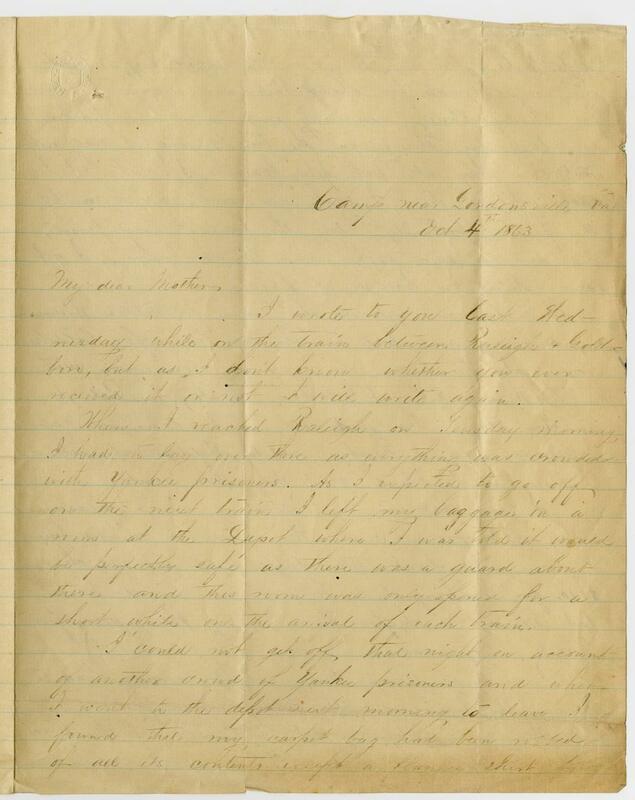 This entry was posted in Southern Historical Collection and tagged 27th North Carolina Infantry Regiment, clothing, Gordonsville Va., James Augustus Graham, Orange Guards, prices, prisoners-of-war, railroads, Raleigh N.C., religious revivals, Wilmington and Weldon Railroad. Bookmark the permalink.